KATHMANDU, Jan 4: The country missed the target of welcoming one million tourists in a calendar year by a whisker. According to data compiled by Department of Immigration (DoI), Nepal welcomed 940,218 tourists in 2017. The government had set a target of welcoming one million visitors during the Nepal Tourism Year 2011 campaign. But the target has eluded the tourism sector so far. “If we count the number of Indian tourists entering Nepal through land route, the arrivals figure will cross the one million mark,” Raju Prasad Poudel, information officer of DoI, told Republica. 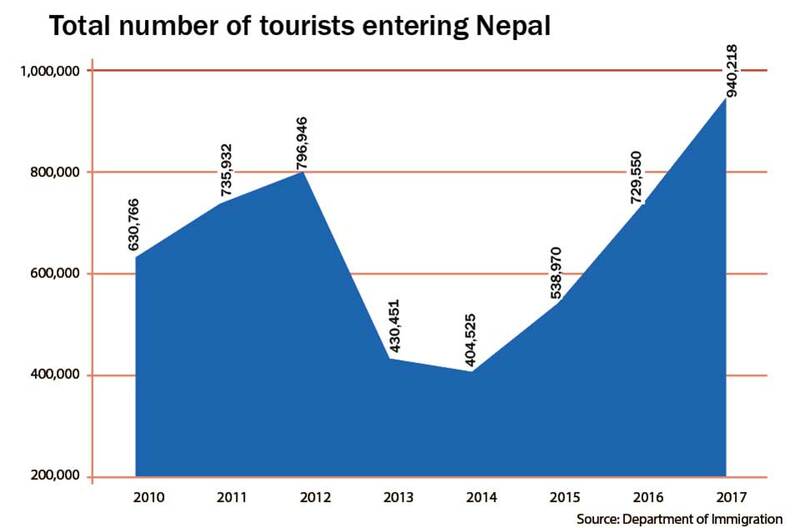 The number of Indian tourists entering the country without registering at the immigration offices in border points is also very high, according to Poudel. Though the target of welcoming one million tourists could not be achieved in 2017, tourism entrepreneurs are buoyed by the arrival figures. Talking to Republica, Amar Man Shakya, president of Hotel Association Nepal (HAN), said that the tourists industry of the country is gradually improving with the increasing number of tourist arrival. “We could not bring tourists as much as we have expected. But tourist numbers have increased significantly compared to past year. It is a positive thing,” he added. He, however, added that rise in tourist footfalls still lower compared to supply of rooms. Hotel occupancy was around 65 percent only during September to November. 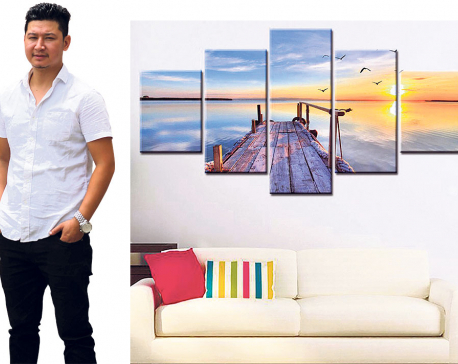 We need more tourists to fill our rooms,” added Shakya. Santabir Lama, president of Nepal Mountaineering Association (NMA), said the industry is elated with the rise in tourist footfalls this year. “We should not be disappointed because of our failure to meet the target of one million tourists. We were very near to the target. Hence, I consider the year 2017 as a successful year for the tourism industry,” Lama said, expressing home that the country will welcome more than a million tourists in 2018. Lama also said that tourism will prosper further in the coming days as the country is getting a stable government after many years with the successful conclusion of the election. Nepal has an immense opportunity for tourism development. Despite many political challenges and infrastructural hurdles, tourist arrival has been growing steadily in recent years. Investment in the hospitality industry has also been growing accordingly. Tourist arrival, which was hit hard by the earthquakes of 2015, started picking up from 2016, when the country welcomed 729,550. In 2012, tourist arrivals had hit an all time high of 796,946 due to positive impacts of Nepal Tourism Year 2011 campaign. India continued to become the largest tourist generating market for Nepal in the year 2017 as well. According to the data, 160,832 Indian tourists entered Nepal in 2017. Similarly, China was the second largest market for Nepal with 104,664 visitors while the US (79,146), the United Kingdom (51,058) and Sri Lanka (45,361) were at the third, fourth and fifth position, respectively, according to DoI.